You can take that as a full-disclosure statement if you like, but believe me, if I didn’t enjoy their books, I would never say I did. Plainly Caitlin has excellent taste in the writers she signs, because so far I love the books written by her other clients. 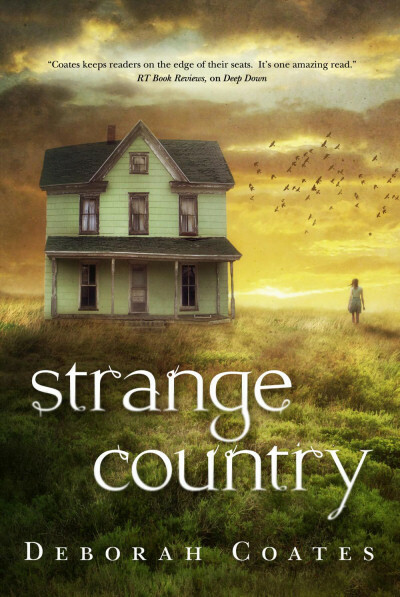 So, anyway, before it gets completely buried by other posts, here’s an excerpt of STRANGE COUNTRY by Deb Coates, over at tor.com. Another great cover for this series. I am kind of into covers-without-people, so I like this a lot. So far each book has been self-contained, so I don’t know whether Deb has a fourth book planned, but I’m not too worried about the possibility of cliffhangers. Also, though I really liked both the first and second books, I preferred the second, so I’m eager to see what Deb has done with the third. In the comments, we’ve seen some mention of “unlikable” female characters recently. This series is interesting to me because some readers find Hallie unlikable. I like her a lot, personally. Would this be considered dark fantasy? It may be a tad darkish, but I would categorize it mainly as contemporary fantasy and let it go at that. I haven’t seen anybody else comment about the subtlety with which Hallie’s father is handled, but he is one of my favorite secondary characters. And of course I love the setting. I really enjoyed THE PRINCESS CURSE — I think it made my top-ten list the year it came out, and if it didn’t, it was a close contender. I also enjoyed HANDBOOK FOR DRAGON SLAYERS, though not quite as much. But! 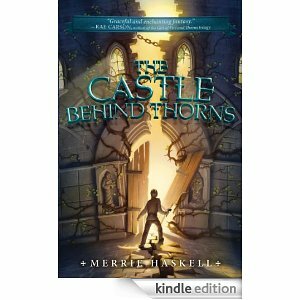 CASTLE BEHIND THORNS is my favorite book by Merrie so far. I am very, very eager to see this final version of CASTLE BEHIND THORNS, because I read a late version in draft. I had one problem with a character’s actions at one point toward the end of the story and I am very curious to see what if anything Merrie might have changed there. I have mentioned this before, but this is the one where Merrie Haskell has only one character on stage for a large chunk of the book. That sure presents unique challenges for the author! It works beautifully in this story. Obviously this is a Sleeping Beauty retelling, you got that from the title, right? It is a must-read if you like retellings, and don’t we all? Anybody else excited for anything in particular that’s hitting the shelves in May? I have a galley of Castle Behind Thorns, but haven’t been able to get to it yet. I can’t wait! Another May book I’m looking forward to is The Night Gardener by Jonathan Auxier. New Martha Wells novelette, hurrah! Illias’ and Gilliad’s first adventure. I’ll look forward to seeing what you think of Castle, Brandy! And yes, I’m looking forward to reading the Ile-Rien story — maybe even tonight. Gosh, now I really want to re-read the Ile-Rien trilogy. Re-reads or new books, what a dilemma! 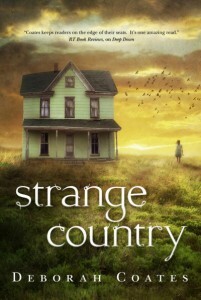 I’m really looking forward to STRANGE COUNTRY. I loved WIDE OPEN and DEEP DOWN, and I’m excited to finally get more about Boyd. Have you read Alex Bledsoe’s THE HUM AND THE SHIVER and WISP OF A THING? They seem very much in that vein of “rural fantasy”, like Coates’. But a very different type of rural, of course–Appalachia, not the Dakotas. No, I haven’t. I guess I should add one to my wishlist. I did read something set in rural Appalachia. Duranna Durgin maybe? Not quite sure. I read Bledsoe’s TH&TS about the same time I read Coates’ WIDE OPEN, and much prefer Coates, FWIW. I saw a lot of inconsistencies – stuff that sounds like placing Checkov’s gun on the wall, but it never went anywhere, that kind of thing – and the main character was ripped from the headlines. The combination never let me get in to it. OTOH my husband also read both and prefers the Bledsoe, although he wasn’t aware of it at the time, seeing the same flaws I did. He later remarked that it lingered more with him. I, too, am looking very much forward to STRANGE COUNTRY. I’m not exactly recommending them, but there’s also the Tom Dietz (sp?) which are set in Appalachian Georgia, IIRC. And there’s always Manley Wade Wellman’s SILVER JOHN stories. Oh, yeah, I really liked the SILVER JOHN series when I read it! I’d forgotten about that series. I should go see if there’s a Kindle version.